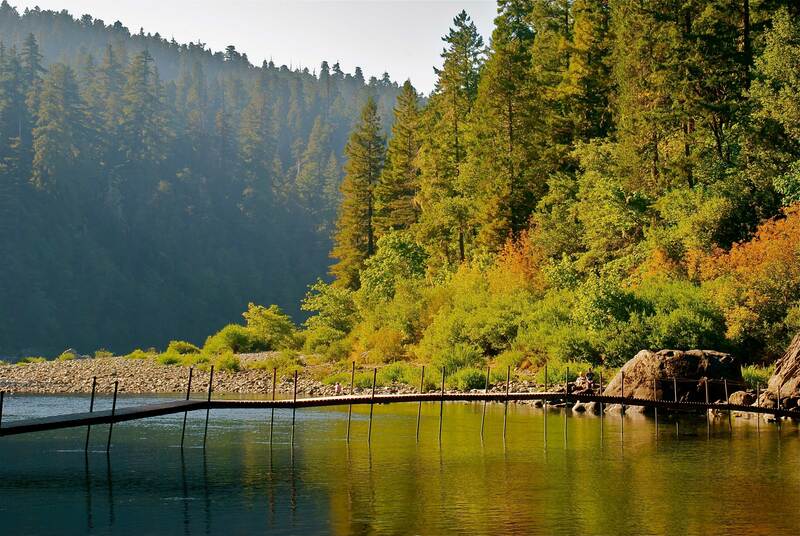 Most park activities—including hiking, biking, horseback riding, kayaking, snorkeling, fishing, scenic driving, and camping—focus on the Smith River and the park’s remote old-growth redwood forest. If you have an hour, drive through some of the park’s largest old-growth redwoods on Howland Hill Road. If you have half a day, drive out Howland Hill Road to Stout Grove. Stroll through the gigantic trees and picnic beside the Smith River. If you have a full day, drive out Howland Hill Road to the Boy Scout Tree Trailhead and take an amazing hike into the heart of the park. 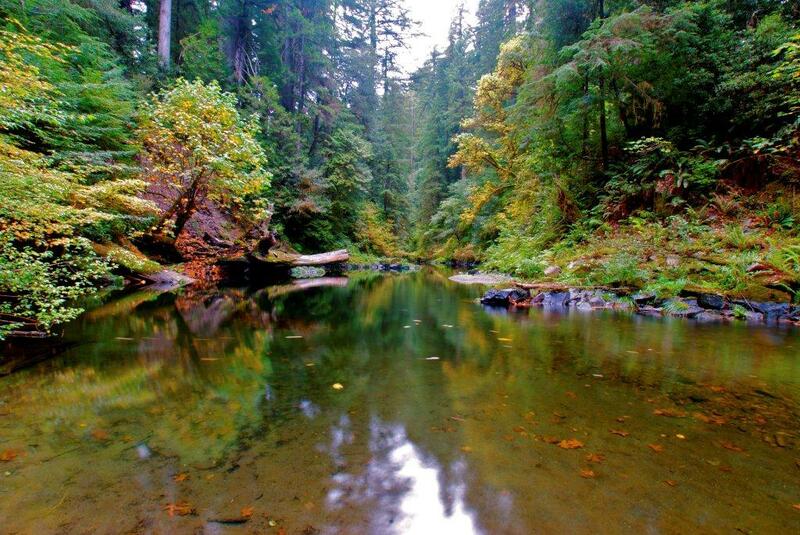 Jedediah Smith Redwoods State Park has 20 miles of hiking trails. Bring water, appropriate clothing, and a trail map. This easy loop showcases stately Stout Memorial Grove. On a sunny day, the grove’s colors are most spectacular in late afternoon. The grove was named for lumberman Frank D. Stout, founder of Knapp, Stout & Company—one of the largest lumber companies in the world in the 1870s and 1880s. Stout died in 1927. His wife, Clara, donated the 44-acre grove to Save the Redwoods League, which helped establish the park in 1929. Driving east on Howland Hill Road, the trailhead is at mile 6.7. After circling the grove, you can walk down to the Smith River. In summer, a footbridge leads to the park’s campground (also accessed from Highway 199). To get to the trailhead, turn off Highway 101 onto Elk Valley Road at the south end of Crescent City. After 1.5 miles, fork right onto Howland Hill Road. You can begin viewing magnificent trees from the car. In four miles, the signed Boy Scout Trail takes off to the north. More than a century ago, supplies were hauled inland from Crescent City on a wagon road made of redwood planks. Hikers can view parts of the old Crescent City Plank Road at the northern end of the park on the Leiffer and Ellsworth Loop trails. Along the way are coast redwoods, big-leaf maple, vine maple, western hemlock, and California hazel. In spring, there’s a burst of color from trillium, wild ginger, clintonia and many other flowering plants. Start at the Leiffer loop: Drive east on Highway 199, turn north on unpaved Walker Road and proceed about half a mile to the trailhead. Be prepared for hiking up short and generally shady ups and downs. Starting in a redwood forest near the Smith River, head upward 1,800 feet, passing through plant communities you won’t see elsewhere in the park. Port Orford cedar, knobcone pine, bear grass, and hairy manzanita are just a few of the interesting species. At 3.3 miles from the trailhead, you’ll find a Redwood National Park backcountry campground with 4 sites, a horse corral, and non-potable water; at 4.8 miles, you head into Smith River National Recreation Area. From there, you can walk downhill an additional 5 miles on the Paradise Flat Trail to South Fork Road. Bikes and horses are permitted as well as hikers. The marked trailhead is near the east end of Howland Hill Road. For additional hiking suggestions, try the Redwood National and State Parks website. Bicycles are permitted on all public roadways and one backcountry route: the Little Bald Hills Trail. Yield to equestrians along the trail. Pedal uphill through old-growth redwoods from the trailhead (mile 6.7 coming from the west on Howland Hill Road). At 3.3 miles, in Redwood National Park, there’s a primitive campground with 4 sites, a horse corral, and running (but non-potable) water. At 4.8 miles, the trail crosses the Smith River National Recreation Area boundary. From there it’s another 5 miles, mostly downhill, to South Fork Road on Paradise Flat Trail. Bring water, appropriate clothing, and a trail map. Horses and other pack animals are permitted on one backcountry route in Jed Smith: the Little Bald Hills Trail. Head uphill through old-growth redwoods from the trailhead (mile 6.7 coming from the west on Howland Hill Road). At 3.3 miles, in Redwood National Park, there’s a primitive campground with 4 sites, a horse corral, and running (non-potable) water. At 4.8 miles, the trail crosses the Smith River National Recreation Area boundary. From there it’s another 5 miles, mostly downhill, to South Fork Road on Paradise Flat Trail. Bring water, appropriate clothing, and a trail map. The Smith River is a prized part of America’s National Wild and Scenic River System. According to the Smith River Alliance, it’s also “a floater’s playpen, if you know what you’re doing.” In the summer, park naturalists offer free kayak tours. http://www.nps.gov/redw/planyourvisit/kayaktours.htm. For other boating options, check this site: http://www.nwrafting.com/smithriver. Built in 1850, 10-mile-long Howland Hill Road leads from Crescent City to the town of Hiouchi, past some of the park’s most impressive old-growth redwoods. From Highway 101 at the south end of Crescent City, turn east on Elk Valley Road. Take the right fork on unpaved Howland Hill Road after about 1.5 miles. The gravel road, with a speed limit of 15 miles per hour is not recommended for trailers. Be sure to sure to stop occasionally, step out of your car, and feel the magic of the ancient forest. From the day-use area just off Highway 199, you can visit the marker for the largest World War II memorial in the country. The 5,000-acre National Tribute Grove was dedicated in 1949 after a nationwide fundraising effort led by Save the Redwoods League, Garden Club of America, and Daughters of the American Revolution. Jedediah Smith Campground has 87 family campsites. Each has a table, fire ring, and cupboard, with restrooms nearby. Some sites can accommodate trailers or motor homes up to 36 feet (with no hookups). Reservations are recommended between Memorial Day and Labor Day. For reservations, call 800-444-7275 or use the reservations link on the park's home page. Hike and bike campsites may not be reserved. The exceptionally clear waters and deep pools of the Smith River are home to steelhead, salmon, and cutthroat trout. If you have a snorkel and mask, you can watch them as you swim. The water is cold, even in summer, so you’ll need a wetsuit, preferably with a hood. For safety, dive with a buddy. You can fish-watch on your own—or participate in the annual Smith River Alliance Fish Survey http://smithriveralliance.org/fish-monitoring. When you arrive, pick up a self-guided Junior Ranger Adventure Guide and a schedule of events at any one of five visitor centers serving Redwood National and State Parks: from south to north, the Thomas H. Kuchel Visitor Center for all four parks at Orick; Prairie Creek Visitor Center in Prairie Creek Redwoods State Park; the Jedediah Smith Campground and Hiouchi centers (open May to September only) off Highway 199; and the Crescent City Information Center in Crescent City. Most of the park’s ranger- or docent-led programs for children offer games, crafts, hiking, and exploring. Aimed at kids age 7 through 12, they usually start up on Memorial Day weekend and end after Labor Day. Check at a visitor center for days and times, or call 707-458-3496 or 707-458-3294. Redwood EdVentures are fun for the entire family. Take a self-guided treasure hunt in many North Coast redwood state parks, including Jedediah Smith. Find the final clue and win a cool patch! Before heading to the park, explore the Redwoods Learning Center set up by Save the Redwoods League. The center offers fun redwood-themed activities, classroom tools, and ways to get involved in redwood protection. Redwoods bingo, anyone? For even more ways to enjoy Jedediah Smith Redwood State Park and environs, go to the Smith River Alliance website or check out the latest Redwood National and State Parks Visitor Guide.